Safety Stainless steel dematting brush won't hurt your pets, safe and durable to use. With extra long 2.5" stainless steel dematting blades and rounded handle make it easy for you to use. 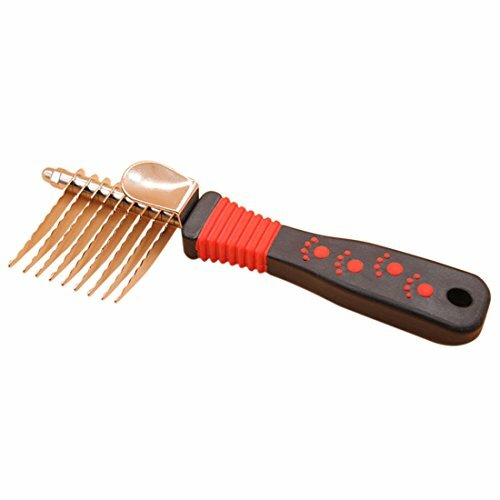 This unique pet grooming tool reaches deep into thick fur to quickly break up knots, mats tangles. Comfortable grip and non-slip handle can ease the wrist and wrist tight, no matter how long you brush. Best grooming rake for undercoat brushing, idea for longhaired animals such as horses rabbits. Style, color random. If you have any questions about this product by Fcoson, contact us by completing and submitting the form below. If you are looking for a specif part number, please include it with your message.